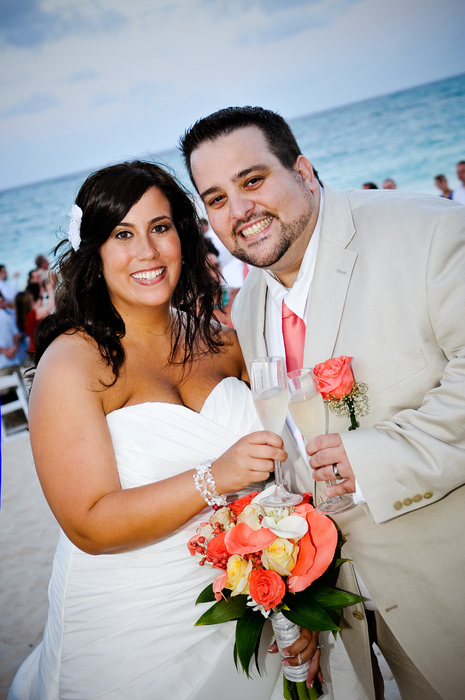 Bride and Groom were wed on April 21, 2012. 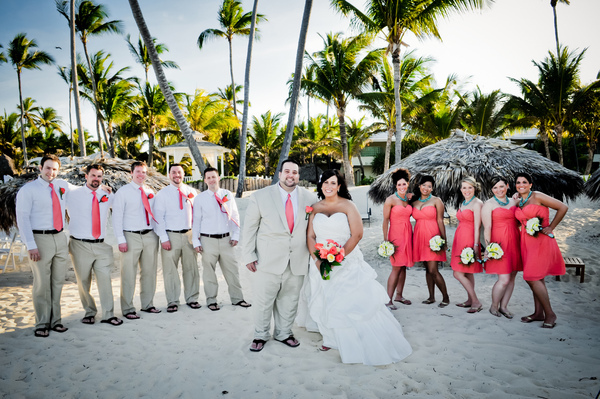 Cortney, username cdc150, used the BDW Community to bring her destination wedding to life. 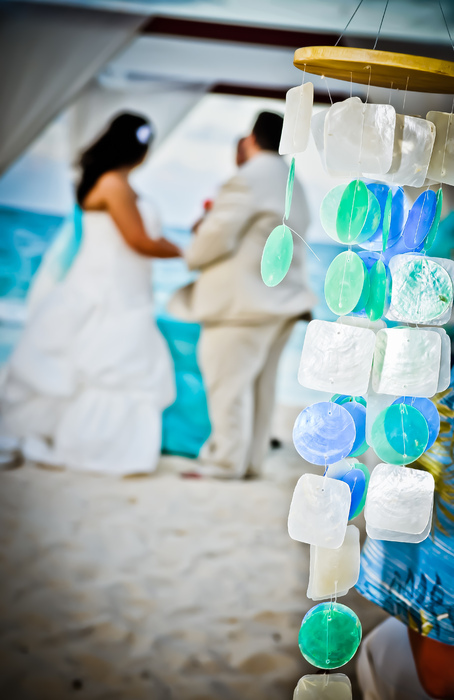 Why did you choose to have a destination wedding? Mike and I are both beach lovers. His parents have a house at the Jersey Shore where we go regularly every summer. Our first vacation together was to Jamaica, and our most recent being to Cancun. In Cancun we saw a DW occur and Mike was sold on the relaxed vibe, intimate reception and the general fun it looked the group had the whole time we were there. A few months after our trip he proposed to me at sunset on the beach of North Wildwood. It was such a romantic moment with the sun setting as he got on one knee, we couldn't think of anything more special than saying I do the same way! Why did you choose your location? 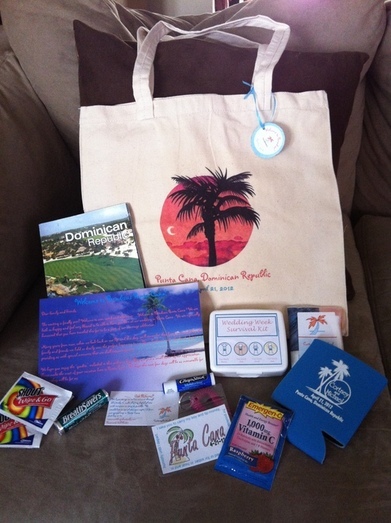 After speaking to our travel agent, we found Jamaica, Mexico and the Domincan Republic most affordable for our guests. 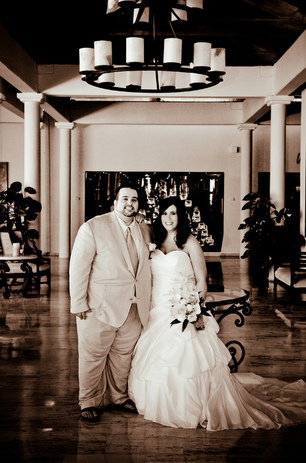 We went to Jamaica in 2009, and although we had a great time, we didn’t see it as a place we wanted to get married. We were just in Mexico in February and weren’t ready to go back. I went to Punta Cana with my girlfriends before I met Mike, and every time we went away I compared our trips to that one. I loved the beaches, the resorts, even the airport. Since Mike trusts my impeccable tastes, he agreed that was the place we should get married. When doing our research, I came across the Paradisus PC’s site and with looking at the pics I fell in love with it. The natural rain forest, the large property, it was just beautiful! After reading extensive reviews of the resorts and emailing brides who had gotten married there, we decided that was the place to get married! Since then I have seen more and more positive reviews of the resort and cannot wait to get there in April. 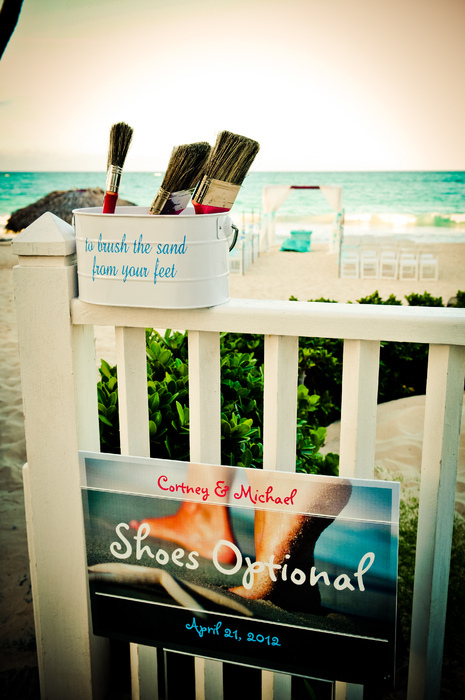 Our theme is beach chic and our colors are coral, aqua and white. I want everyone to be comfortable and relaxed for our big day. Every wedding is special in its own right. What made your wedding unique? I think what makes our relationship amazing is that we have been through a lot together in the past 3 years that would normally break up most couples. The two of us grew stronger because of it. We were going to move in together in 2009, and we were meeting with a realtor on a Saturday in July to go look at houses. That Friday Mike got laid off from his job. 2 months later I got laid off from my job. The two of us were out of work in a very tough market. Luckily 2010 brought both of us good jobs and a home we rent together. Those 6-9 months we so hard on us financially and emotionally, but luckily we had each other to get through it. In October of this year we were in Florida visiting Mike’s parent when we hydroplaned across the highway and got t-boned by a car at 70 mph. It was probably the scariest night of our lives. Luckily parties in both vehicles were okay. The fact that we are alive and relatively unharmed makes me know that our marriage is meant to be. Our wedding to us it just a big party to celebrate our commitment to each other. By the time we get married we would have been living together for 2 years and together for 4 years. We have a dog, we’re building a house and our friends and family always joke that it’s like we’ve been married for the past 2 years. We don’t expect our relationship to change much after the big day, we are just happy we get to share the rest of our lives together! One of the major challenges of putting together a destination wedding is finding and working with your ideal vendors from afar. 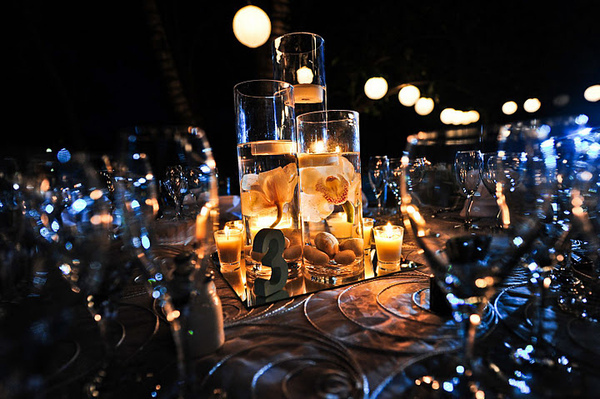 What wedding vendors did you use to put together this spectacular wedding? You were an active member of BDW and created some great content. Could you please summarize (with hyperlinks) some of your best work for us? 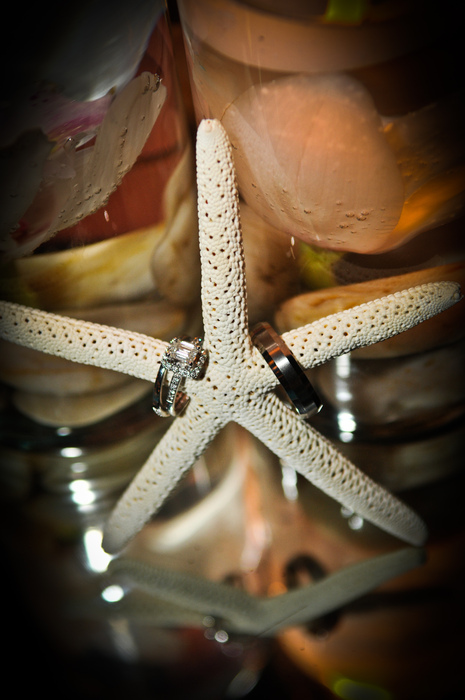 Dear members, if you planned your wedding with the help of our community we would love to hear from you. 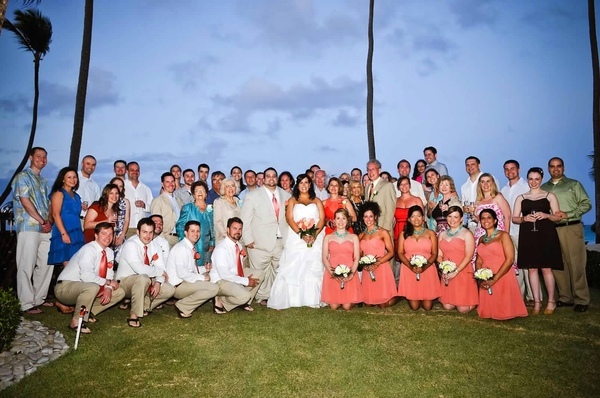 Contact us at admin@BestDestinationWedding.com if you are interested in sharing your wedding experience with us. For more information here is the "BDW Real Weddings | Featured Wedding Submission Information Thread"
Thank you for featuring us! It truly is an honor to be profiled here! Ahhh!!! You have just found our destination for us!!! I think I love you!!!! 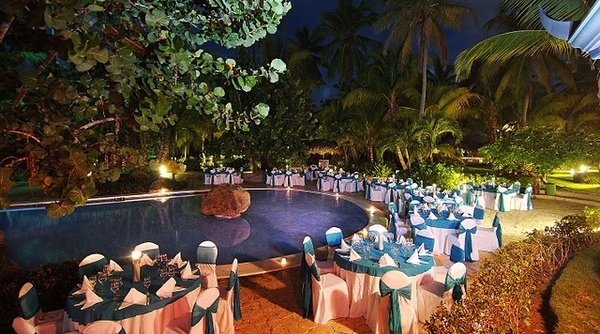 I have been searching for a location in Punta Cana for a few weeks now, as we love it as well...this looks amazing. Are those tables at the poolside at night your actual tables at the resort? I love the way it looks...thank you so much for sharing, you have no idea how happy coming upon this just made me Congratulations on your amazingly beautiful wedding!! Thank you! If you have any questions, let me know! This post is absolutely amazing. 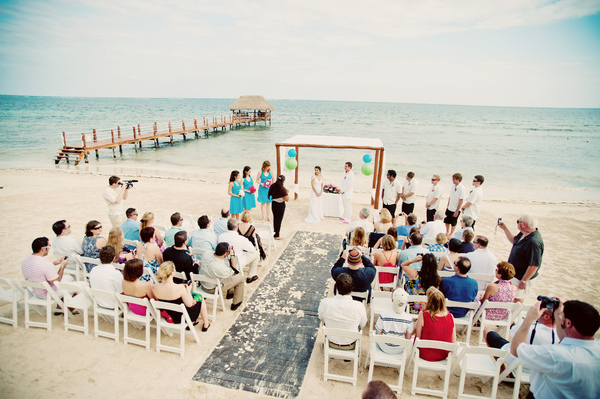 I am very interested in having my wedding at PPR after researching various resorts. My questions to you would be the level of involvement of the onsite coordinators during the process? I am pondering if I should get a stateside planner, but want to make sure this will be be a waste. Are they responsive via email? Also, I noticed that you had your reception at the poolside. Was there a dance floor inserted there? I know there is a fee, but just want to see if there is room.